In this project, we focused on demands in Spanish and how to use them in a conversation. We were asked to make a cooking show incorporating demands, all in Spanish. My partner and I decided to make churros. We made script, and translated an English recipe to Spanish. 8 tazas aceite de colza, para freir. Por la churros: Pon un largo una cacerola en medio calor. Añada 1 taza agua, la, mantequilla, azúcar y sal. Calenta a 155 grada F, entonces pon en la harina y mezcla con un cuchara a incorpora y saca la masa, por uno minuto. Usa la cuchara, añada la juevos en la masa uno a tiempo, incorpora después cada, incorpora hasta incorpora. Pon la masa en un pastel bolsa con un punto estrella y pon en la aceite de colza, forma 6-pulgada tiras. Freir por for 3 to 5 minutos. Saca con un cuchara y pon en un plato. Pon la azúcar y la canela en un tazón. Pon la churros en la tazón y íntegra muy rápido. The Mi Frida project had a main focus on Frida Kahlo, her art, and our own interpretation of her art. My Mi Frida was of Claude Monet, I picked this person because I was inspired by his paintings and I was excited to do my own interpretation of his paintings. I felt that my work was not bad, but I had a different vision originally. I wish I had spent more time refining and adding to my essay. If I were to do the project again I would spend more time on a draft of my painting as well as adding onto my essay. I feel that I improved on my Spanish quite a bit, because of the fact that the entire essay was meant to be written in past tense. I definitely spent a lot of time on proper past tense conjugations. Working on conjugations in a form of an essay was helpful because I got to see how the words worked with larger sentences/paragraphs. Calaveras are a traditional theme of El Dia de Los Muertos. Incorporating calaveras and art was originally popularized by Jose Guadalupe whom was a popular artist during the 1800’s. He was most famous for making fun of the political system in Mexico through his art. Guadalupe used calaveras to make fun of the wealthy in his country. Calaveras are popular during Dia de Los Muertos because they are used to make fun of the concept of death. 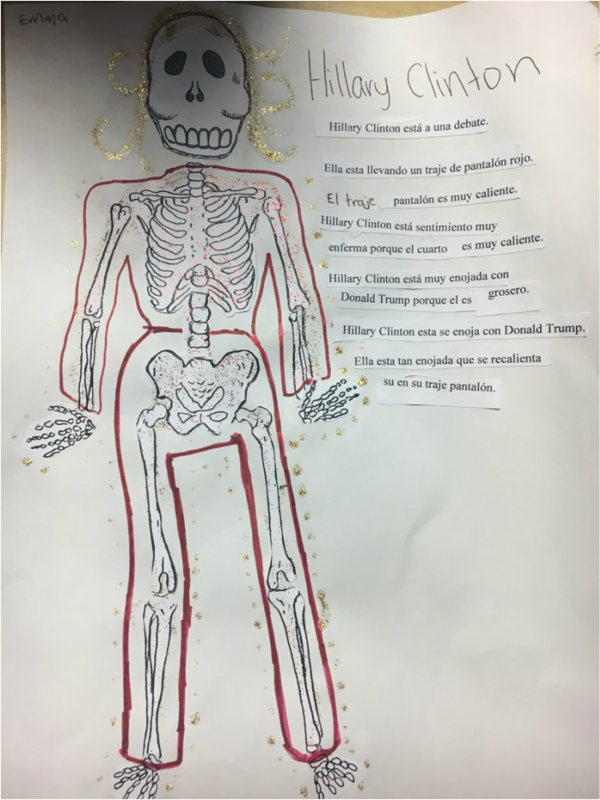 My calavera was supposed to be of Hillary Clinton. I think that the writing portion of the project was more successful for me. I felt more successful with the writing because I was able to get a better understanding of what I was learning in the class by having to write it out. I wish I had put more effort into the art portion of this project. I am not completely happy with my calavera and how it turned out.